Whether she knows it or not, every girl who has ever dreamed of taking her place in a line of high-kicking dancers on a football field at halftime has been inspired by the Kilgore College Rangerettes, the world's first precision dance drill team. Founded in Kilgore, Texas, in 1939-1940 by the incomparable Gussie Nell Davis, the Rangerettes have performed for national and international audiences, appearing frequently at events such as the Macy's Thanksgiving Day Parade and major football bowl games across the nation, including the New Year's Cotton Bowl Classic in Dallas each year since 1951. An icon of Americana, the red-white-and-blue clad Rangerettes have drawn the attention of numerous photographers and writers seeking to understand the enduring appeal of a group that some might view as anachronistic. O. Rufus Lovett, a fine art photographer who has taught at Kilgore College for more than thirty years, began photographing the 'Rettes in 1989. His interpretive photo essay in this book expresses his fascination with "the glamour of the Rangerettes' performances juxtaposed with the small-town atmosphere, football turf, metal bleachers, chain-link fences, and asphalt and concrete environment." In Lovett's masterfully composed photographs, the Rangerette performances captivate with their multiplicity of "shapes, patterns, and designs." While Lovett treats the 'Rettes as an artistic subject, he also captures the esprit de corps that keeps the girls smiling even when they have to march on icy pavement and prompts their mothers to wear T-shirts that proudly proclaim "Rette Mom." 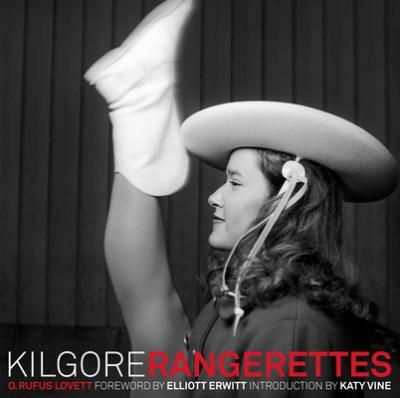 An affectionate, yet unsentimental and occasionally irreverent portrait, Kilgore Rangerettes beautifully conveys the timeless quality of this unique subculture of young American womanhood. O. Rufus Lovett is a nationally acclaimed photographer and author of the books Weeping Mary and Kilgore Rangerettes. His work has received recognition from the prestigious Alfred Eisenstaedt Awards for Outstanding Magazine Photography. In addition to teaching photography at Kilgore College, Lovett works as a fine art and editorial photographer. His photo-essays have appeared in Texas Monthly, American Photo, Photo Review, LensWork, People, and Gourmet. He has also been profiled in Southern Living. Elliott Erwitt is an internationally renowned photographer who has been a member of the Magnum Agency since 1953. His introduction to the Rangerettes came by way of an assignment from Paris Match magazine to document Texas culture in the aftermath of the Kennedy assassination. What he found led him eventually to produce the widely viewed Rangerettes documentary "Beauty Knows No Pain." His recent books include Unseen and Personal Best. Katy VIne is a Senior Editor at Texas Monthly, in which she has covered the Kilgore Rangerettes. Her work has appeared in Best American Sports Writing 2005, Best American Sports Writing 2006, the Oxford American, the Texas Observer, and on the radio program This American Life.